Dr Laura Evis is a forensic bioarchaeologist who adapts and applies various archaeological and anthropological techniques to help answer questions and solve problems for medico-legal investigations. Topics of interest include the development of specialist search, location, recovery and recording methods for forensic casework, including work conducted in domestic, international and mass disaster settings. 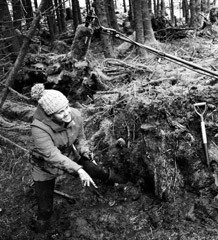 Laura's previous research focused on experimentally testing existing archaeological excavation techniques and recording methods to validate their suitability for use in forensic casework. Laura teaches across a range of subjects, but specialises in forensic archaeology and anthropology. My research focuses on the adaptation and application of archaeological and anthropological techniques to forensic investigations. My specific research interests include the following topics: forensic archaeology, forensic anthropology, biological anthropology, archaeological excavation methods, archaeological recording systems, experimental archaeology, mass disaster recovery and emergency response planning. Jennifer Mack, PhD Candidate, Differential mortality and mortuary treatment of adolescents in nineteenth-century American cemeteries. Bioarchaeology. Evis, L.H., Darvill, T., Cheetham, P. and Hanson, I., 2015. Searching for a Standard: The impact that method selection has on evidence recovery in forensic archaeological investigations. Washington DC: International Forensics Symposium. Evis, L.H., Darvill, T., Cheetham, P. and Hanson, I., 2014. Digging the Dirt: An evaluation of archaeological excavation and recording techniques and their applicability in forensic casework. Austin: Society for American Archaeology. Hanson, I., Pelling, S. and Evis, L., 2008. Towards Standards in Forensic Archaeology: Examining the impact of method on interpretation. Washington DC: American Academy of Forensic Sciences. Title: Dig it! Intersections Between Excavation Methods and Recording Systems. Conference: Society for American Archaeology (SAA). Date: April 2012. Location: Memphis, United States of America. Title: Madness in our Methods? The state of the art and intersections between excavation methods and recording systems. Conference: Chartered Institute for Archaeologists (CIfA). Date: April 2012. Location: Oxford, United Kingdom. Title: Dig it! Intersections Between Excavation Methods and Recording Systems. Conference: Theoretical Archaeology Group (TAG). Date: December 2011. Location: Birmingham, United Kingdom. The Quality Assurance Agency for Higher Education (QAA). Egyptian Journal of Forensic Sciences (EJFS). Dr Evis is on the committee of the Forensic Archaeology Special Interest Group (CIfA). Dr Evis is a fellow of the Royal Anthropological Institute (RAI). Dr Evis is an Emergency Response Team Member for Blake Emergency Services. PhD. Title: Digging the Dirt - A Comparative Analysis of Excavation Methods and Recording Systems in Relation to their Applications in Forensic Archaeology. Institution: Bournemouth University. Dates: October 2010 - March 2014. Supervisors: Professor Timothy Darvill OBE and Paul Cheetham. Examiners: Dr Edward Harris MBE and Dr Martin Smith. PGDip. Title: Forensic and Biological Anthropology. Institution: Bournemouth University. Dates: October 2009 – September 2010. MSc. Title: Forensic Archaeology: Crime Scene and International Investigations. Institution: Bournemouth University. Dates: October 2008 – September 2009. BA (Hons). Title: Ancient History and Archaeology. Institution: Cardiff University. Dates: September 2005 – July 2008. Mass Grave Short Course, Bournemouth University, April 2010. Muscular Anatomy Short Course, Bournemouth University, 2008-2010. Expert Witness Training Short Course, Bournemouth University, 2008-2010. CRANID Software Short Course, Professor Richard Wright, Bournemouth University, April 2009. Air Crash Recovery Short Course, Bournemouth University, February 2009. British Association for Biological Anthropology and Osteoarchaeology (BABAO). British Association for Human Identification (BAHID). Chartered Institute for Archaeologists (CIfA). Chartered Institute for Archaeologists Forensic Archaeology Special Interest Group (CIfAFASIG).